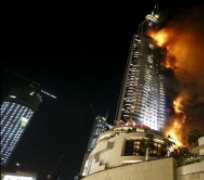 SAN FRANCISCO, December 31, (THEWILL) – A huge fire has engulfed Dubai's luxury hotel, The Address, located in downtown. The property, which is about 63 floors high, is also home to residential apartments, restaurants and a mall. It is near the world's tallest building, Burj Khalifa. The Address is very popular with tourists. The cause of the New Year Eve's fire is unknown.